Are you looking for a present for a girl/woman in your family? If they are anything like my daughter, I'm sure they love makeup. My daughter is a makeup fanatic. She is 17 and probably has more makeup than anyone I know is constantly looking for more. Most of it is for everyday use but some of it has been used for dance recitals. I got the chance to get her a gift from Tmart. 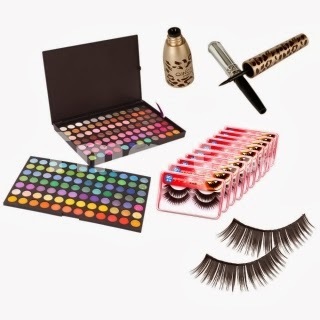 They have loads of great items (not just makeup) at great prices. However, I knew one of her favorites would be makeup. After taking a look around, we decided to check out the 168 Color Eyeshadow Palette Eyelash Liner Makeup Set. I mean really, how could we go wrong with so many colors of eyeshadow, eyeliner, and false lashes. Now, I'm not a big fan of false lashes but she has always needed them for dance reviews. The eye shadow came in a nice little caddy. We really thought the eyeliner was neat. You get a liquid eyeliner and a pencil. What is neat is that they fit together in one little bottle. The top part comes off and is the pencil. The bottom part of the bottle is the liquid eyeliner. Then of course she got a big box of fake eye lashes. She got 10 boxes of eyelashes. Each little box of lashes comes with 2 sets of eye lashes. Needless to say, my daughter loved it. She couldn't wait to get into the makeup. She couldn't wait to experiment with all of the eye shadows, and of course, had to try out the fake eye lashes. I had to pin her down to get her to tell me anything and to take some pictures. If you are looking for something that girl/young woman in your life, then you definitely need to check this one out. They will love it, and will experimenting with all of the colors. I'm sure they will find the perfect shade of eye shadow to go with each and every outfit. One of my readers will be the lucky winner of this great makeup set. To enter all you need to do is use the Rafflecopter form below.